It is with great pride that the agency Roadmaster Booking announces the first European tour of the bands THY SYMPHONY LOTHLÖRYEN. The tour will be divided into two parts. 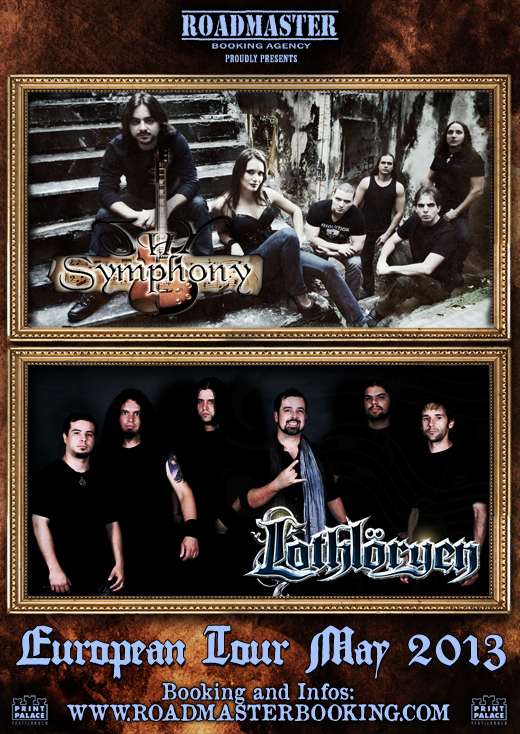 In The first part of the tour will be exclusively with the Symphonic Power Metal sextet THY SYMPHONY from Sao Paulo, who will be releasing both songs from their second album “A New beginning” – to be released in 5th April by the European label Sleazy Rider Records – as tracks of the album “The World harmonizing.” Concerts are planned for Germany, Holland, Belgium, France and Austria. In the second part of the tour there will be also the participation of the sextet Melodic / Power Metal Folk LOTHLÖRYEN, who will be promoting his latest work “Souls Raving Society” as well as the second version of the album “Some Ways Back Some More.” This step will focus on concerts in Hungary, Romania, Bulgaria, Greece and Italy.